One moderately common form of automation is the user greeting. You can find these all over the web. Ever been to a website where, after a few seconds, a small noise plays and a chat window opens in the corner, asking if you have in questions or if they can help you with anything? That’s a bot, making the offer, which will then connect you to an actual service rep if you respond. Likewise, sometimes you can follow a Twitter account and get a DM immediately, thanking you for your follow and recommending the next action that you can take. Email is the obvious one as well; sign up for a newsletter and you get a nice welcome message with some content and confirmation about your sign-up. What about Facebook? It’s the largest social network in the world and it’s guaranteed to be useful for pretty much every business. If you’re already working to connect with your audience, why not put some kind of automatic messaging in place? 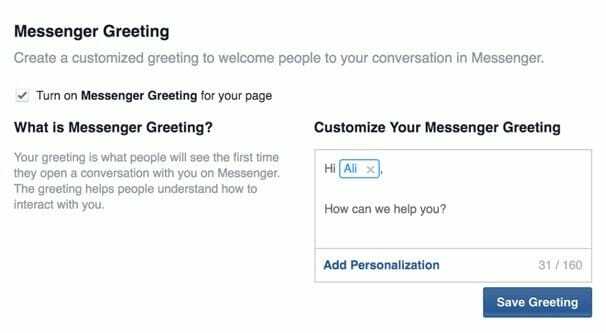 Facebook has something called a “messenger greeting” but it’s not what you might think it is. The fact is, Facebook doesn’t want brands sending out unsolicited messages to their followers, either in mass new messages or as new user welcome messages. Brand pages – any kind of “page” rather than a profile on Facebook, really – cannot initiate messages. The only way you’re able to reach your followers is by directly posting on your wall and hoping they see it in their feed. This is a bit of a problem for some brands, given how reach works these days. There’s so much content and so much saturation on Facebook that the vast majority of the possible content you could see is filtered. Brands often see under 10% reach, usually closer to 6%, without factoring in advertising. That means when you post a message, only six out of a hundred users will see it. Plus, it doesn’t work for a new user greeting; if it’s public, it’s not personal, and thus it’s not performing the function you want it to perform. So about that messenger greeting. It’s not a welcome message like you might hope. Rather, it’s a default message that appears whenever a new user opens up a messenger window to your page. If you’ve ever used the live chat customer service on Amazon, you’ve probably see that when you initiate contact, a message is already there, telling you a rep will be with you in a moment, etc. This works the same way; you create a customized message that anyone who opens up messaging can see. First of all, you need messaging enabled. If you have messaging disabled, people won’t be able to contact you via Facebook messages. They will have to use wall posts, reviews, or off-site contacts like email or phone. To turn on messaging, click the settings button at the top of your page. In the general section, click messages. There will be an option that says “allow people to contact my page privately by showing the message button.” Check that box and save your changes. 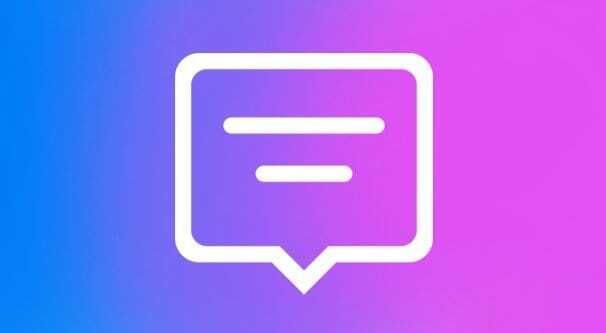 With messaging enabled, anyone who is an admin, editor, or moderator for your page can respond to messages, if a user initiates the conversation. Additionally, the private message can be used to respond to a public post. Pages cannot send messages to anyone who hasn’t posted or messaged them before, nor can they send messages to other pages. Now, to create a messenger greeting, you will need to go back to that settings menu. Under the messaging section, click “show a messenger greeting” so it’s set to Yes. There you can click “change” to edit the message you want to show up when someone goes to message you. Facebook has some tips for proper messaging. Don’t enable messaging unless you’re prepared to respond at pretty much all hours of the day. Facebook even has a public “responds within X hours” metric. If you don’t respond, people will lost faith in your customer service ability. Plus, if you ARE responsive, you can get the “Very responsive to messages” badge, which is quite beneficial. Keep it casual. Remember; you’re a real person having a real conversation with another real person. Don’t write like a bot, don’t copy and paste scripts, make sure your tone is friendly. BE a real person, don’t just pretend to be one. Keep your messages short. A few sentences to help with an issue is fine, but don’t send a form letter you would normally send via email. It’s too long and clunky for something as slick as messenger. Add a personal name to communications. Don’t sign them –Business, sign them –John, or whatever you want for your customer service persona. Don’t abuse the saved replies feature. Saved replies are template messages that you can use to send common responses to common issues. It’s best left for frequently asked questions, not individual questions. Make them specific and personalized. Unfortunately, messenger greetings don’t fit the bill for what we’re looking for. You want to send a message to anyone who follows you, but you can’t send unsolicited messages. Or can you? 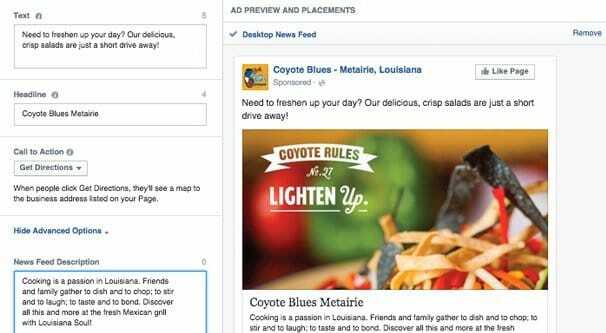 There are two different ways you can use ads to interact with the Facebook messenger application or the desktop built-in messenger. One of them is through local awareness ads, and the other is with specific messenger ads. Local awareness ads are limited, but they’re probably perfect for a large number of people reading this. Most of you have local businesses, small businesses that thrive on a local audience rather than a global audience. Local awareness ads are based on geographic location and trigger when a user is nearby. By “nearby” I mean within a couple of miles, generally, and sometimes even closer. You can use these ads to entice people to visit your business. You can highlight promotions, deliver fun facts, represent a new item, or play along with a local event; whatever works for you. Local awareness ads can have several different calls to action. The most common is generally “get directions” to bring people in from off the street. You can also have a phone number added so that when a user taps on the ad, they automatically make a phone call to your store. The one we’re concerned with primarily is the “Send message” call to action. 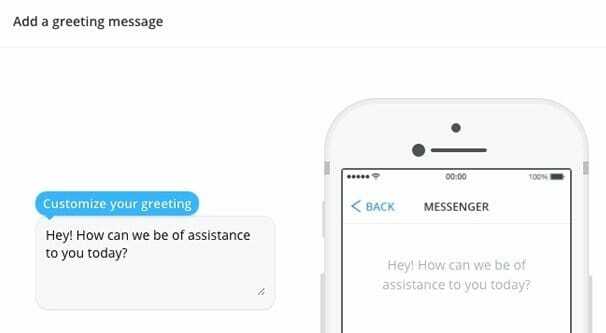 The send message action is a button that tells people to send you a private message via messenger for questions, directions, or anything else they could need. You can couple this with messenger greetings to deliver a customized message when the user taps your ad. The limitation to this is, of course, that it’s locked to local areas around your business. If you’re not in a busy location or you’re not in an area people typically use Facebook, you won’t be able to get much use out of those ads. Plus there’s the issue of the user needing to click your ad in order to get the message. So what was the other option? When you go to ads creation and create an ad with either the traffic or conversion objective, you’re given some further options. When you then choose either a carousel, single image, single video, or slideshow, you can choose “messenger” as your destination rather than your website or store page. You can then create a welcome message. From there it works the same way as the local awareness ads. The call to action is opening the messenger, and any welcome message or ad message you set is sent. They can then talk to you however they want, and you are free to respond. The biggest problem with both message ads and local awareness ads is that they’re ads. That means they cost money, they don’t show up to people using ad blocking apps, and they require the FB Messenger app to be installed on a mobile device for them to appear. Plus, they still don’t do what we want to do, which is sending a greeting to new followers. You can target your ads towards new followers, but that’s only a partial work-around and doesn’t really get to the meat of the problem. There’s one way I have heard of that can message users via Facebook Messenger without needing to pay for ads and while circumventing the “user must initiate contact” rule. Before I go into it, though, I want to express a few things. First, I don’t know how these bots work. If they do circumvent a Facebook rule, it’s possible that they’re in violation of the terms of service and that they could stop working at any time. This service has been around for about a year and has managed to continue to exist without having its API keys revoked, but that’s not to say it can’t happen. Second, you need to take Facebook’s communications rules to heart. The reason they don’t allow brands to initiate contact is the same reason you have to sign up for a newsletter before Amazon can email you; unsolicited and unwanted communications are spam and are actually illegal. Sending out too many messages to people who don’t ask for them is likely to lose you followers and to have your account blocked. You might see higher ad costs or even removal of some features if you’re reported too often. Third, you’re not supposed to use this service to offer coupons, deals, or special offers. I suspect that this rule is part of why the service still exists; it’s not stepping on the toes of Facebook ads. You can send out pulse surveys, educational courses, and segmented messaging, but you can’t promote deals or ads. Finally, if you want more perfect control over your messaging, I recommend going a different route; creating an app. This is a bit of a digression here, but bear with me. If you want to send push notifications to a mobile device, you can do so via an app. An app can be downloaded through Facebook, and it ensures that your audience is specifically made up of people who want to receive your messages. Of course, this takes dev money and time, and still isn’t a welcome message, so I guess it’s outside the scope of this post. So, what is the service? If you’ve been clicking links, you know it: ManyChat. 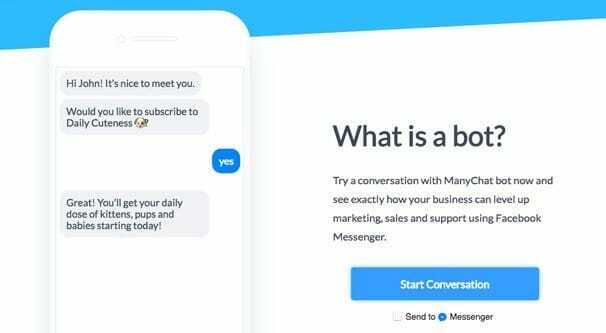 ManyChat is essentially a WYSIWYG bot creation engine for Facebook. You can set it up much the same way a customer service voice line is set up: a series of flowcharts and moments where users are asked to provide their input. It can send information, provide anwers, and even greet new subscribers when they follow your page. You can also use it to send out mass messages to your entire subscriber list, though again, this is a dangerous feature. There’s another similar option out there called Chatfuel. It works in the same basic way, with a visual programming engine for a chatbot, but it’s a little more robust in terms of interactivity. It can learn and respond to phrases it might not otherwise know. Again, I’m not sure how it sends out messages, so be careful with implementing one of these bots. ManyChat is not a free service, by the way. They have scaling pricing depending on the number of users that follow your page. If you only have 1,000 subscribers, you’re paying $15 per month. Bump that up to 5,000 and your cost is $45 per month. They also monitor how many followers you have and will automatically lower your plan tier if you drop below a threshold, so you’re not being overcharged. It goes in increments of 500. As for Chatfuel, their service is free for under 500,000 followers. Above that, you’ll have to contact them for enterprise pricing. You can also have them make a bot for you, which will cost money as well.